Our affordable funeral options offer choices to honor your loved one’s wishes and pay tribute to their lives and service to our country — without busting your family’s budget. 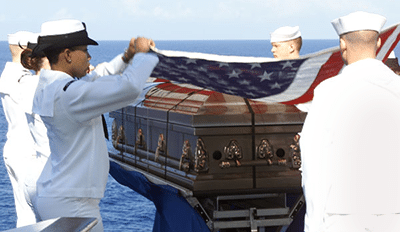 These straightforward package plans are ideal as a final salute to a beloved life with a respectful funeral service followed by burial — on land or at sea. In addition, we can arrange for veteran-earned benefits, such as military honors and burial or storage in a national cemetery. Our funeral plans include everything needed for a customary service and burial — from high-quality casket and embalming services to funeral coach and expert services of funeral directors and staff. Dependent family members of active duty personnel, retirees, and veterans of the armed services.